Delaware residents are experiencing the highest level of flu illnesses over the last five flu seasons. Nationally, there are unusually high levels of confirmed flu cases as well. 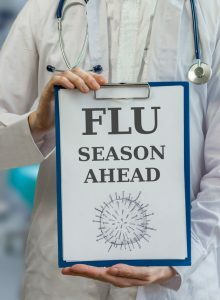 The Division of Public Health (DPH) reported that there were 650 lab-confirmed flu cases recorded in Delaware between the 21st and 27th of January. The highest single-week record during last flu season was 571. So far, the state has seen four flu-related deaths this season. The number of flu-related hospitalizations across the nation is also the highest it's been in the past decade. A total of 398 people have been hospitalized as of January 27 in Delaware alone. According to DPH, infants and children have been most heavily affected by the recent increase in flu illnesses. Children under the age of four account for 277 of flu cases this season. Nationally, 53 children have died of flu illnesses this season. Because of how hard this season is, DPH is recommending all Delawareans try to still get the flu shot. Unfortunately, there's no way to tell how long flu season will last or how much worse it will get. How Can You Protect Yourself Against the Flu Virus? The dreaded flu season comes every year and wreaks havoc across the nation. In fact, according to a National Health Interview Survey, the flu virus is responsible for 200 million days of reduced productivity as well as 75 million days of absence from work. So to keep yourself, your family, and your coworkers at a lower risk of getting infected, we've compiled a list of a few easy ways you can stay healthy this flu season. Wash your hands. This may seem obvious, but washing your hands on a regular basis can make a huge difference. This is especially important if you work in close quarters and have to share office equipment. Keeping your hands clean, particularly before you eat or touch your face, can help keep germs away. Stay home if you're sick. While some people refuse to stay home sick from work, you're only doing more harm than good. Going to work while sick will not only make you feel worse, but you're putting your coworkers at risk of getting sick too. So remember that when it comes to illnesses, "sharing is caring" does not apply. Keep your surroundings clean. This is one of the most important things you can do to stay healthy, especially at your place of employment. Investing in Delaware commercial cleaning services is a great way to help rid your office of germs. Commercial cleaning contractors know which places harbor the most germs, which products to use to kill said germs, and how often office cleaning should be done. Overall, investing in Delaware commercial cleaning services is one of the best things you can do to keep yourself and your coworkers safe this flu season. Unfortunately, even if you get the flu shot, you're still at risk for catching the dreaded virus. So it's important you take necessary actions, like keeping your hands and work area clean, to protect yourself and those around you. If you're looking for trustworthy Delaware commercial cleaning services, contact Gemini Janitorial Service and Supplies today.